There’s another practical way of spending the billions of pesos allocated to the Department of Social Welfare and Development for the 4Ps program of the government. The usual norm is to give cash to families so they can send their children to school. They also have to meet some other requirements. Now, here comes a novel way of helping the very poor by teaching the families to raise pigs for sale with funding from DSWD. The scheme was crafted by Ronald Costales, the award-winning organic farmer-entrepreneur who runs his farm in Majayjay, Laguna. He has come up with a scheme that the DSWD gladly adopted for Region 4 or the Calabarzon area. Under the scheme, the 4Ps beneficiaries are provided with three weanlings to raise up to market size. The DSWD pays for the weanlings, the feeds, simple housing and the training conducted by Costales. No cash is released to the beneficiaries, only the material inputs. The pigs are grown the organic way. And the beneficiaries are taught to concoct their own hog feed using locally available materials. Total cost of the package for one beneficiary is about P20,000. The cost includes the three weanlings, simple housing, feeds, and most important the training that is provided by Costales. Growing pigs the organic way can be really profitable if the beneficiaries follow the techniques of Costales and Jess Domingo who initially enrolled in the seminar conducted by the Costales Nature Farms. Domingo who is an accountant has proof to bolster his claim that he can make a profit of more than P5,000 per head of fattener that he raises to a weight of 90 kilos. His cost of feed (fermented for 15 days) is just about P10 per kilo. One fattener, he says consumes about P3,500 worth of feeds up to market size. The other costs of production include the cost of weanlings, labor, electricity and some miscellaneous expenses which amount to a little over P5,000 per head. When the pigs grown by the beneficiaries attain marketable size, say 80 to 90 kilos, Costales will buy back the organically grown pigs at a price that is P10 per kilo higher than the prevailing price in the market. In addition, Costales will set aside for the farmer P5 per kilo that he buys. This serves as a saving for the farmer. At the end of the year, Costales will give the amount saved to the farmer for him to celebrate the holidays or for other purposes. At the end of the growing period and the hogs have been sold, the family keeps all the proceeds. Say the pigs weigh 80 kilos and the selling price is P120 per kilo liveweight, this means that the raiser will gross P9,600 per head or a total of P28,800 for the three porkers. Part of the money could then be used to finance the farmer’s next batch of fatteners. 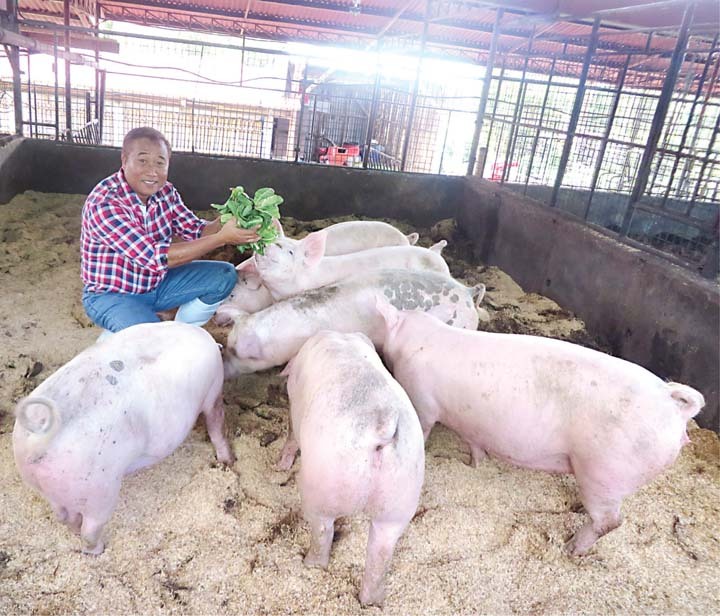 There is another incentive for the hog raisers who are successful in their project, meaning they were able to raise their pigs to the desired weight at a profit. The DSWD will then provide them with 30 day-old chicks of the native breed which they can raise in their backyard. The farmers will also be trained on the basics of raising the native chickens the organic way. And if they will have extra eggs to sell, Costales will also buy them. The hog raising scheme was implemented about a month ago and so far there are 50 families participating. More will be recruited who will have to undergo training to make sure that they will take good care of their pigs.